Governing from the Grassroots (Fall 2003) | Reimagine! As Californians recover from the tumultuous gubernatorial election in our state while also looking ahead to the 2004 presidential election, the issue of electoral politics looms large. The question is: how do activists and organizations struggling to promote equity in low-income communities and communities of color incorporate electoral politics into our work? In recent years, the Environmental Justice Movement and its allies in the environmental, civil rights, public health, labor and faith-based movements have been assaulted on a number of fronts. It is clear that while our tried-and-true tactics of grassroots mobilization, research and litigation have led to victories, those approaches are not enough. To realize our goals of equity and sustainability, we have to move beyond the strategies we know. For these reasons, Urban Habitat has begun to explore what an electoral strategy would entail for our organization and communities of color in the Bay Area. For one, it would mean partnering with nontraditional allies, including progressive businesses. It would also mean expending the energy, resources and time to promote an electoral agenda that favors equity instead of always reacting to agendas that undermine it. 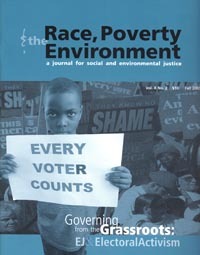 This issue of Race, Poverty & the Environment is dedicated to examining the intersection between environmental justice and electoral politics. With key elections on the horizon, we wanted to provide our readers and partners with tools and strategies to influence and implement electoral campaigns.